To remember those killed in the Indian Army's Operation Bluestar inside the Golden Temple complex in 1984, the Sikh clergy Sunday laid the foundation stone for a memorial inside the complex here. The five high priests of Sikhism dug the soil to mark the start of work on the memorial close to the Harmandar Sahib, the holiest of Sikh shrines, in the presence of hundreds of devotees. Sikh devotees are expected to carry out 'kar sewa' (voluntary service) at the site over the next few months till the memorial is completed. The Shiromani Gurdwara Parbandhak Committee (SGPC), which manages the shrine and other gurdwaras in Punjab, had announced last week that a memorial would be built inside the complex. Sources at the shrine said the spot chosen for the memorial, located close to the Akal Takht, the highest temporal seat of Sikhism, is the place where security forces, led by the army, found the body of radical leader and Damdami Taksal chief Jarnail Singh Bhindranwale. 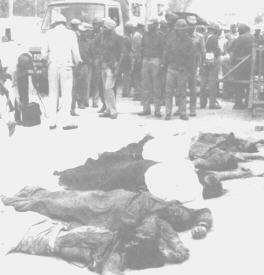 Operation Bluestar was carried out by the army in June 1984 to flush out heavily-armed militants holed up inside the shrine complex. Prime minister Indira Gandhi, who had ordered the operation, was assasinated by her Sikh bodyguards in October of the same year. The Indian Army's 13th chief Gen. A.S. Vaidya, who had planned the operation, was assassinated soon after his retirement in January 1986. Bhindranwale was accused of leading them to seek a separate Sikh homeland, Khalistan (land of the pure). Hundreds of people, including militants, security personnel and devotees, were killed in the army action to free the shrine of militants who had put up stiff resistance. The army had to use tanks, armoured vehicles, mortars and other heavy artillery to pin down the armed militants. Radical Sikh groups such as the Damdami Taksal, Ul Khalsa and Khalsa Action Committee had been seeking a memorial for those killed during Operation Bluestar for nearly three decades. Construction of the memorial would be carried out by the Damdami Taksal, its chief Harnam Singh Khalsa said.